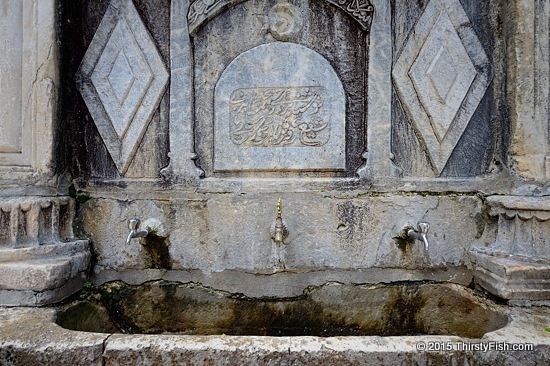 Water fountains have been around for at least 4,000 years. This historic Ottoman era example is likely converted from a Roman sarcophagus. It stands in the Seyit Battal Gazi Complex in the province of Eskisehir, Turkey. Fresh clean water. The world is rapidly running out of fresh water. Financial firms such as Goldman Sachs are describing water as "the petroleum of the next century" while corporate giants like Nestle and Coca Cola have lined up to commodify and profit from water. Pollution and climate change is threatening water resources, and knowing this, mega corporations and governments have long started their geostrategic chess game to gain control of this most fundamental human resource. Wars are already being fought over water. And, some are calling water, "the ultimate commodity". But, is it really? Most urbanites are unaware of any of this. Those who've read a couple of articles, mostly do not care. After all, water flows from the tap. We pay 300 times more for bottled water thinking it is safer than tap water, but it turns out that bottled water is not necessarily safer; That is, for the time being. If a major incident leading to unsafe public water in a city like New York occurs, bottled water prices will skyrocket nationwide and globally [Hint: Bottling companies already know this!]. How much are you willing to pay for a glass of clean fresh water? The Right to Water is a human right that can not be negotiated. We should have clean fresh water fountains everywhere, just like past civilizations did. But, in recent times, governments and corporations have begun to wage a war against this most fundamental human right. In 2005, the sociopathic Nestle CEO revealed his true colors and stated that: "[Some say] ... 'as a human being you should have a right to water'. That's an extreme solution ... [Others say] 'water is foodstuff like any other, and like any other foodstuff it should have a market value' ... Personally, I believe it's better to give a foodstuff a value so that we're all aware it has its price ..." What's next? Is he going to claim that fresh air is 'foodstuff' so that they can charge us to breathe? No wonder Nestle has such a large Corporate Rap Sheet.